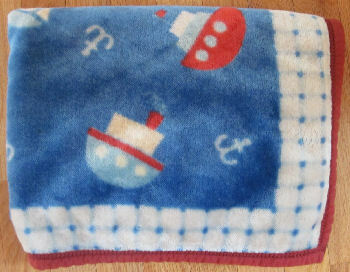 I am desperately searching for a Wamsutta Baby brand navy blue small child’s blanket. It has sailboats and anchors on it, and I think it is either a sailboat/yachtclub/nautica theme. It is fuzzy and extremely soft with a red border. I’m sure it is a discontinued item, purchased at Babies r Us 6 years ago. It measures roughly 42″ by 29″ and is usually a vibrant blue. I have sewn the edges of this so many times…not sure how much more it can take! My son loves his dearly, and it is finally falling apart. I would love to replace it as a Christmas gift. If you or someone else is able to find it, I will be thoroughly impressed! This site is such a great idea! Hope I will be able to help someone someday!